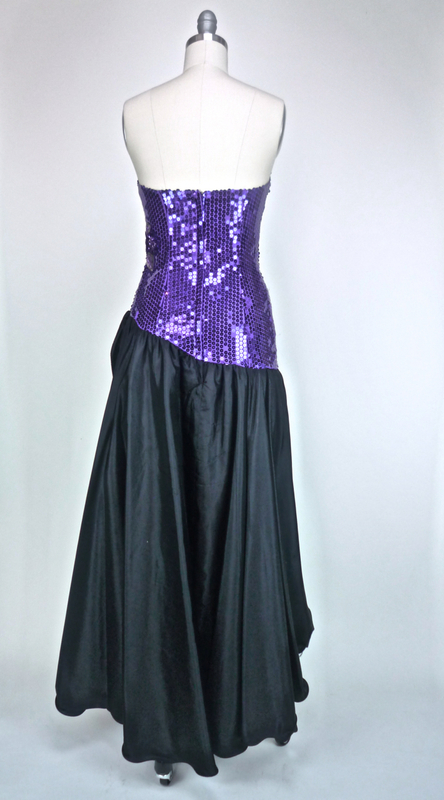 This flirty dress has a Sweetheart neckline, Sheath cut in Drop Waist bodice fully covered in royal purple, and jet black sequins, finished off with a seed beaded floral accent across the bust line. The skirt is full, with tulle underlay with an Asymmetrical hem. Yes. Again with the lace gloves, and this time add a sinamay fascinator with plumes. Any of the above with black high-tops, right! Or you may be more traditional, so go with stilettos.